I was so happy to get this quilt finished up in time to use through the fall. I sent this one to Kathy to be quilted and without any direction from me she did these amazing rows of loopty loops every 2 1/2”….it adds so much to this quilt. Here’s a better look at Kathy’s quilting. For some reason I bought almost a whole bolt of this Bella solid blue fabric a long time ago…luckily it makes a nice backing because I think I’ve backed 5 quilts with it now! The pattern is Basket Case…you can find the pattern here. Good luck! If you have an Android or iPhone, JoAnne's has an app with coupons! It's so beautiful! I'm definitely making one. I love this quilt! I will be making one, for sure. It will be perfect for my new sunroom! This looks great! And I really like this pattern! I'm in the middle of making one of these now. Measure, measure, measure! At each step, measure! That blue is a perfect back. Isn't it nice to have tons of something you really like? I love this pattern – it just looks so cozy. another winner! I love that quilting too! Perfect for this quilt! You have impeccable taste/style when it comes to colors from your stash. I'm so envious of that skill! 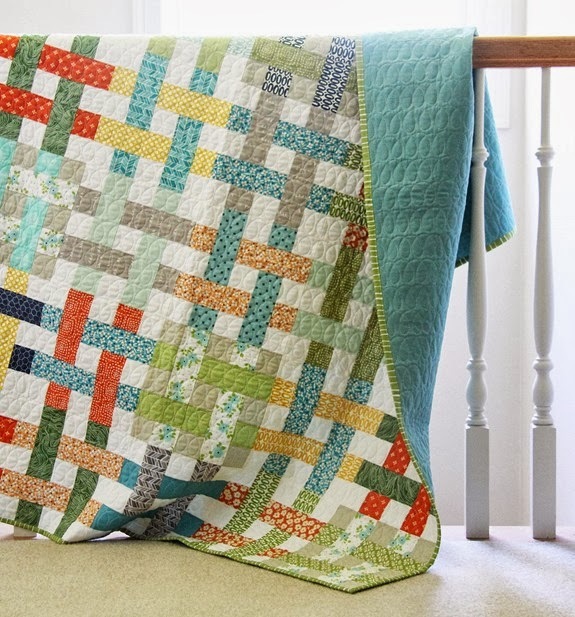 Anyway, I just ordered the PDF pattern and am headed home to bust my own stash with this yummy quilt! Love the colors! Thank you for sharing! =) Good luck with your shopping. Fantastic quilt. Congrats on the finish. Such a beautiful quilt. Love the quilting too! I love it! I might need to pull the trigger on this pattern. I also love the loopy quilting. Well done. LOVE seeing your quilts! Oh I just adore this quilt and the quilting! It's a beautiful quilt! I wish I had some one to send my quilts to! 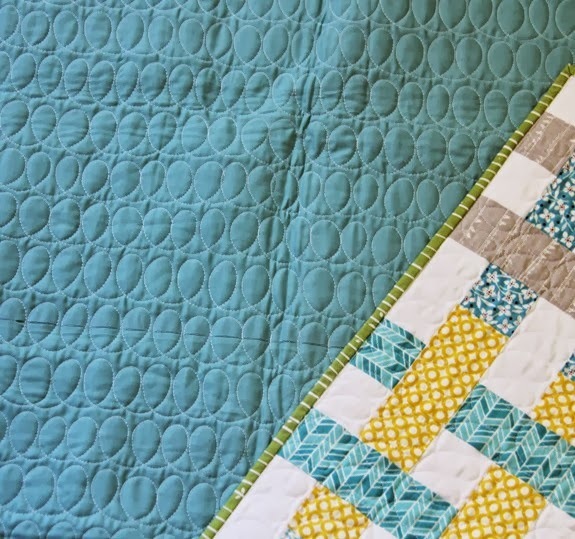 It's the perfect quilting design for this quilt! It looks great! 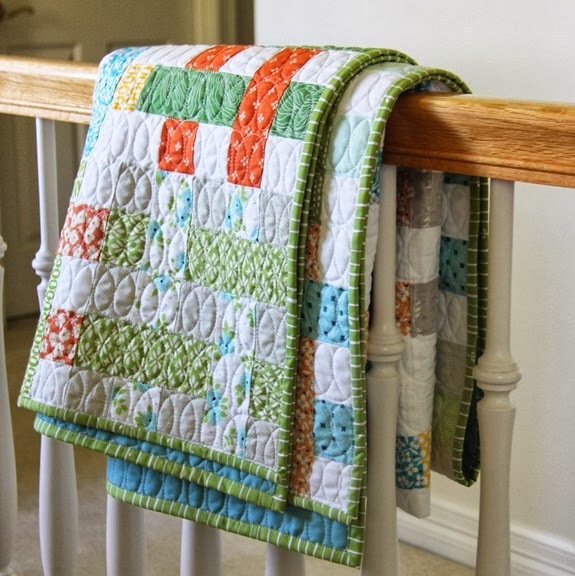 Your fabric choices & patterns are always so perfect, as is Kathy's quilting. I've got a nice bundle of Wallflowers & may use some of it for a sampler quilt along. It looks great! The quilting is so fun! It looks great! I have this pattern, one of 5. I need to gwt busy and make one. I did get a fat quarter bundle of Wallflowers and it is so, so, pretty! I am going to make either Spin Cycle or Seville, both patterns I have! It wont be until spring because we are moving and winter is coming and my 20 hens will need watching. Thank you Allison!! 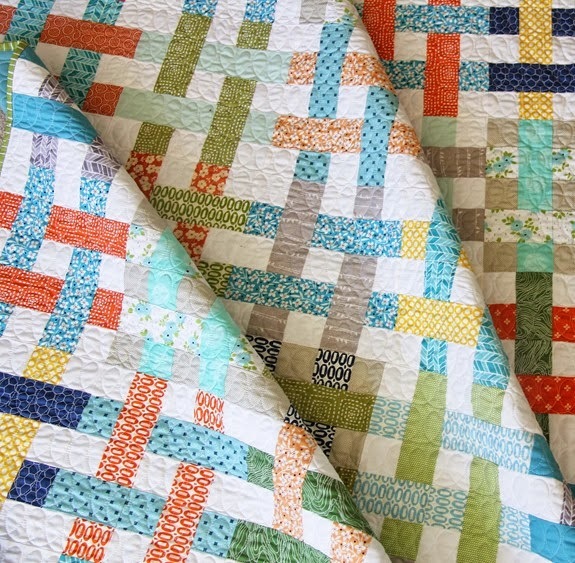 Love the color combination of this quilt. I also love that large white wreath above your bed. What is that made of? Great colours love the design too. Alison .. I probably sound like a cracked record, but … I LOVE all your work. Crisp, fresh colours, simple patterns: so very special in every way. 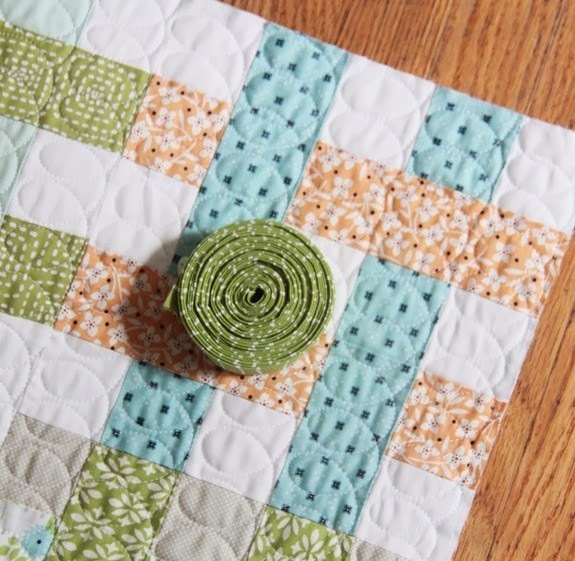 This is coming from a frustrated quilter who dreams of getting back to her machine "one day!" Will love making up some of your quilts for our grandchildren .. 2 of whom live in Seattle. I find just LOOKING at your designs is refreshing!! Love that pattern. I might have to break down and buy it. And ditto on the white wreath! DIY or did u buy it? Great effect from such a simple arrangement, love it. 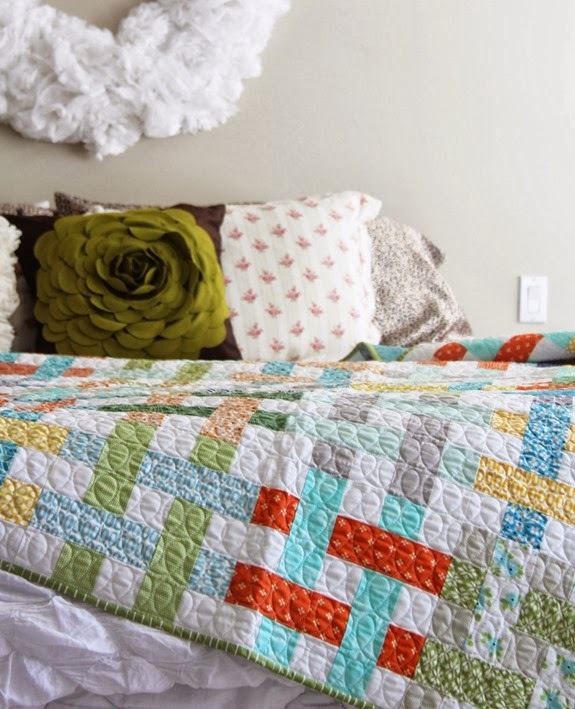 This quilt really jumped off the page for me this morning….the colors/prints are really pleasing to the eye. Can I ask what it might generally cost to send out a quilt to have it quilted? Thanks! Spectacular quilt and quilting.Love your fabrics choice! I always love your color choices!! Such a pretty post! Thanks, Allison – I loved quilting this one! I'm cutting up a jelly roll RIGHT NOW!! I really, REALLY like this quilt. The quilting is wonderful. Such a fun cheerful quilt! This quilt is so awesome! I have to put this one one my to-do list. Great job, I love the colors you picked. I am always in awe of your fabric choices! This quilt is so delightful, I just love it!! The quilt is beautiful. I love the colors and the design. Beautiful, Beautiful. Beautiful quilt…you and Kathy do great work! This is one of my favorite patterns and this is just the reminder to DO IT AGAIN!!! Lovely colors and the line of loops is terrific. Such a beautiful quilt, I love it!! Beautiful fabrics, lots to choose from.